GAME ON® | Hydro Graphics Inc.
Hydro Graphics Inc. has changed the football landscape with our game changing HydroSkin® process. What started in 2009 as a small business painting shells for Oregon State, an Alma Mater of a previous employee, quickly turned into further opportunities with even more teams like: Oregon, TCU, University of Florida, Pittsburgh, West Virginia, and Ohio State. Now HGI has finished helmets for over 200 assorted football teams spanning the NFL, NCAA, CFL, AFL, and High School Athletics. Our revolutionary finish has caught on in other sports arenas such as baseball, softball, lacrosse, golf, and hockey. Here are the teams with helmets by HGI that made the top of the list! Take a look at some of our game changing designs! HGI produces the best of the best in college football helmets, and out of the top 10 coolest according to Sports Cheat Sheet, 6 of the top 10 were the work of HGI. 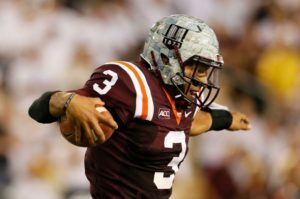 The Virginia Tech Hokies wore these special helmets in 2013. They represented the limestone found in the Blacksburg area, representing the community and the university and programs rock solid foundation. 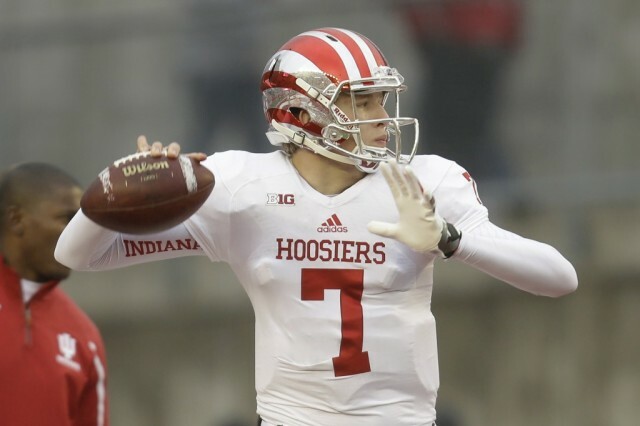 The Indiana Hoosier’s football team took note from the basketball team and deputed these “candy stripe” helmets in 2013. The helmet was chrome with distinctive red stripes. 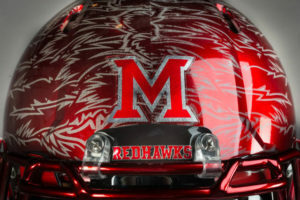 The Miami Redhawks’ helmets from 2013 utilize a feather design relating to the Redhawk mascot and relationship with Miami University’s relationship with the Miami Indian tribe. 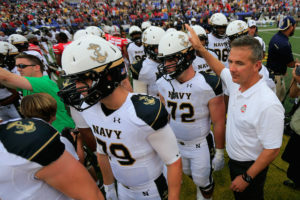 The Navy’s summer white uniform featured new helmets inspired by the “covers that the Mids wear.” This helmet, used in 2014 were part of a new partnership between the service academy and Under Armour. 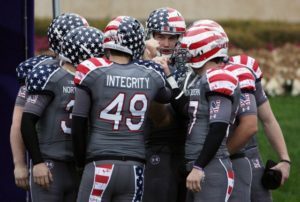 The Northwestern Wildcats wore these special patriotic jerseys in their benefit game against Michigan in November 2013. This game was for the Wounded Warrior Project. The helmets featured the logo, player’s number and the stars and stripes American flag look. HGI creates a variety of creative helmets for football, baseball, hockey, lacrosse, track and field and more. The HydroSkin® process offers a variety of finishes ranging from patterns, to textures as well as our unique HydroChrome® finish. Whatever you envision for your team, we can create it! To see the full list of the coolest helmet designs for the NCAA football teams, view the whole report here. COPYRIGHT © 2011 - 2016 HYDRO GRAPHICS INC. ALL RIGHTS RESERVED.